Jesus asked [Nathanael], "Do you believe this just because I told you I had seen you under the fig tree? You will see greater things than this." 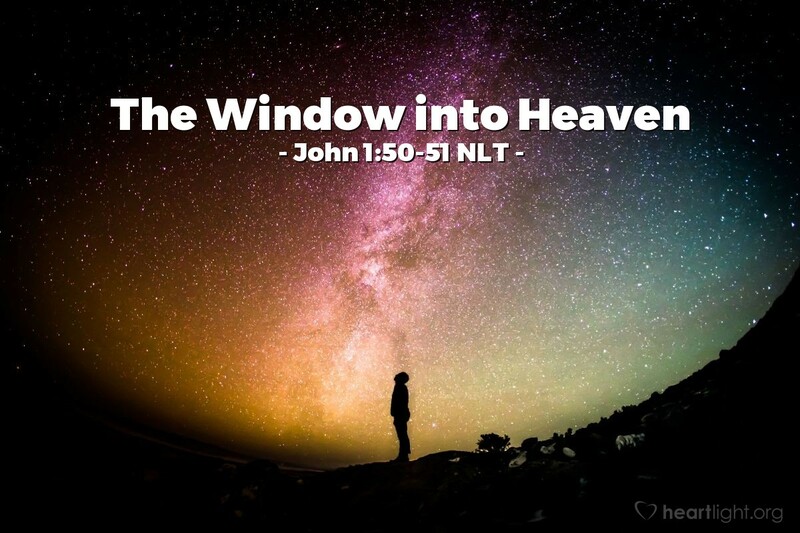 Then he said, "I tell you the truth, you will all see heaven open and the angels of God going up and down on the Son of Man, the one who is the stairway between heaven and earth." Jesus will fulfill and surpass many metaphors, images, and rituals from Israel's rich history. John will show us how Jesus is the great "I Am." Jesus fulfills the meaning of many of the great Jewish feasts. He is "the stairway between heaven and earth," "the bread of life," "the true vine," "the water of life" — each image rich in emotion and meaning from Israel's past. Jesus is challenging Nathaniel to look beyond Jesus' power to know what was in his heart. Jesus wants to lead Nathaniel to see greater things. He wants Nathaniel to know that when he is around Jesus, he is looking through the window into heaven. Father, please help me see you, know you, and love you completely as Jesus teaches me more about you. In your Son's name, I pray. Amen.